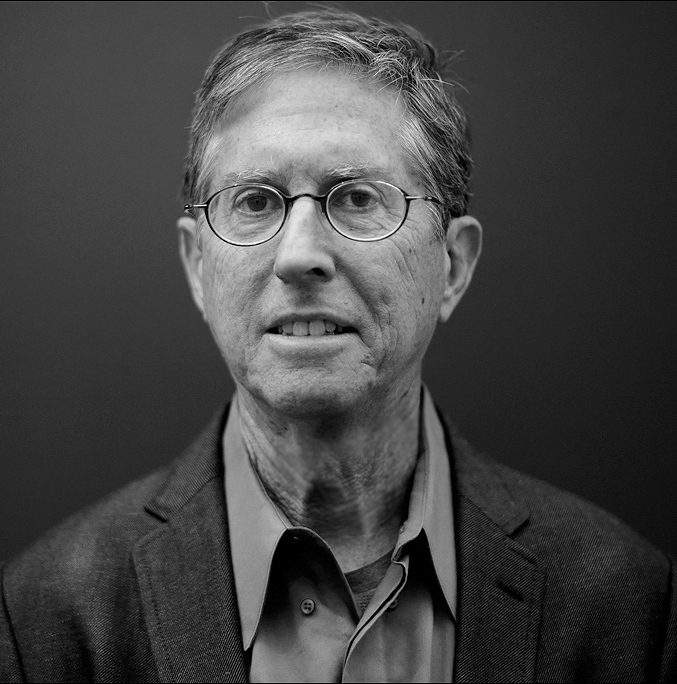 Mike Mandel (b. 1950) moved from Los Angeles to the Bay Area in 1973 to study photography at the San Francisco Art Institute (SFAI). In 1971 he published Myself: Timed Exposures, a book of humorous pictures of himself inserted into commonplace situations and environments, often with strangers. Employing deadpan, low-tech, and serial strategies, he soon became known for his conceptual photographs of subjects ranging from baseball to California car culture. For his most celebrated series, The Baseball-Photographer Trading Cards (1975), Mandel traveled around the country making portraits of such figures as Ansel Adams, Imogen Cunningham, and Robert Heinecken posed like baseball players. Using the nostalgia and camaraderie of the game as a metaphor for the 1970s photography community, he made sets of 135 trading cards that were packaged and sold in random groups of ten with bubblegum. Mandel continued to self-publish his photographic work as an artist’s book with the conceptual art piece Seven Never Before Published Portraits of Edward Weston (1974), a book of responses to questionnaires he sent to various men named Edward Weston, along with their photographs and letters. He also published SF Giants: An Oral History (1979), a baseball book which consists of ephemera, stories, and photographs Mandel collected while interviewing members of his favorite baseball team that played from 1958 to 1979. During his time at SFAI Mandel met fellow artist Larry Sultan, with whom he collaborated on Evidence (1975–77), a sequence of found photographs from government and corporate archives that has been recognized as one of the most important photographic books of the 20th century. From 1973 to 1990 Mandel and Sultan also developed a series of enigmatic public billboards that rupture the conventions of advertising culture. Since the mid 90s Mandel has collaborated with his wife, Chantal Zakari, on a variety of projects, including several books: The Turk and the Jew (1998), The State of Ata (2010), They Came To Baghdad (2012), and most recently, Lockdown Archive (2015). 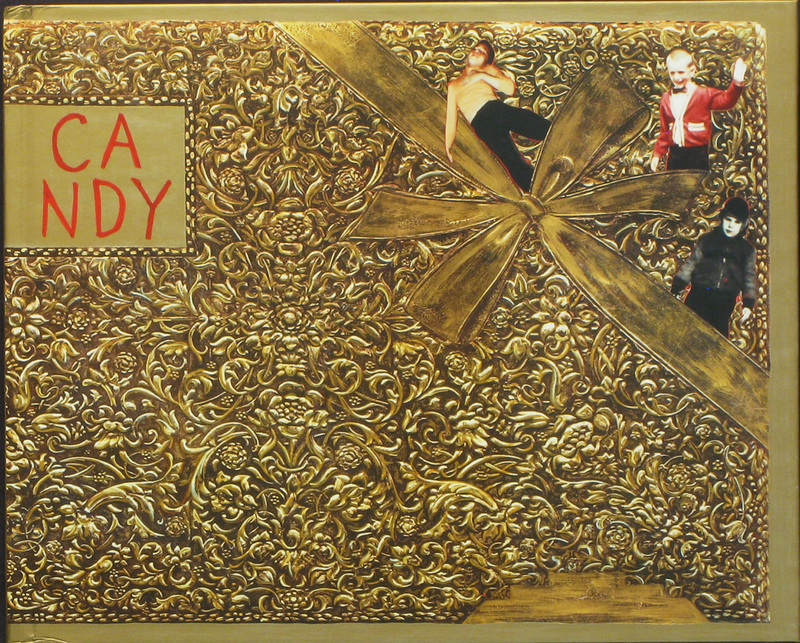 In the 1980s Mandel began to devote more of his practice to public art projects. His large-scale mosaic murals derived from photographs have been installed in airports, public buildings, and schools across the United States, including several in northern California with sites located in Oakland, San Jose, Davis, and San Francisco. He currently lives in Watertown, Massachusetts, and teaches at Tufts University, Medford campus in greater Boston. Candy By Jim Goldberg. Yale University Art Gallery, 2017. Candy takes all that Jim Goldberg has learned about how to design an artist’s book, going all the way back to Rich and Poor and offers a masterpiece of a photographic book. It’s a book that takes Goldberg back home to New Haven, Connecticut in the 70s, where he writes, “My dream was to get out of New Haven.” New Haven was at that time promoting itself as the “model city.” And indeed it was, but not in the way that the city’s officials had hoped. The Black Panthers were fighting for racial justice, an urban renewal was underway that enabled the construction of the interstate highway that cut through the Goldberg family’s candy company, and demonstrations on the Yale campus challenged Nixon’s murderous Cambodia bombing campaign. 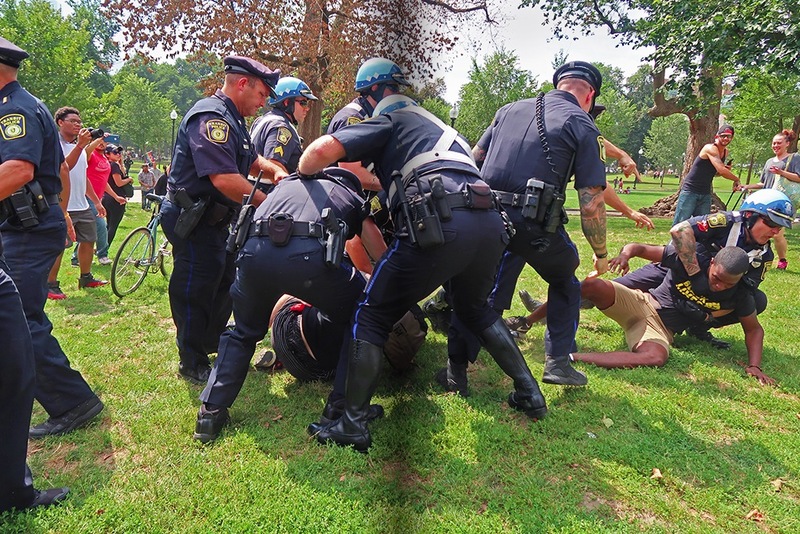 The model of New Haven was emulated across the nation in the cities and college campuses during the 1970s. Goldberg found two individuals who he could collaborate with, Germano Kimbro, a son of a Black Panther member who had shot and killed a police informer in 1969, and Joe Taylor, whose family became Communists and emigrated to the Ukraine. Taylor devoted himself to collecting images of New Haven: postcards, stereograms, cartes de visite, advertisements, etc. 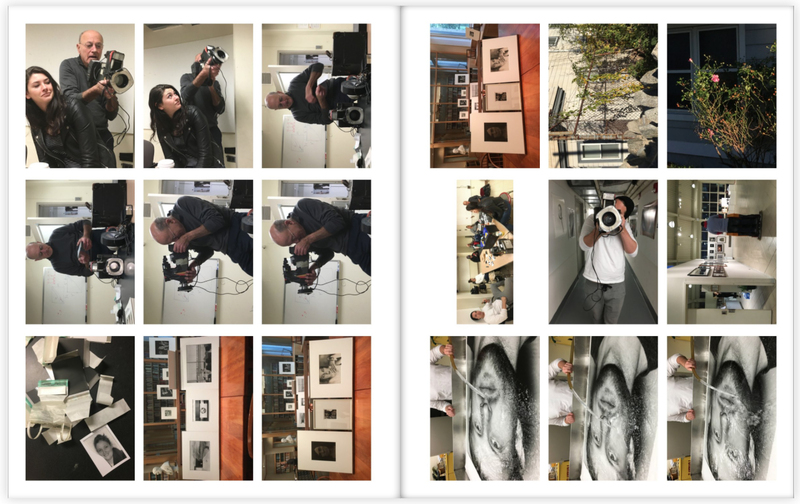 and Goldberg mines this archive and adds even more vernacular documents: movie stills, cut-up snapshots with personal written responses that surround the pictures, much like in Goldberg’s previous projects, and reminiscent of Larry Sultan’s Pictures from Home and Bill Burke’s Minefields. There are symbolic portraits often solitary and sorrowful that complement the scattered messy bits and pieces, which poignantly allude to the mess of life lived. If all that is not enough, Goldberg found a way to surveil the people from his old neighborhood by sitting atop a van as it was slowly driven through the streets, a counterpoint to Google Street view. Instead of blurring the faces as in Google, Goldberg’s photographic performance becomes a subject of interest as he rides on top of the van and receives many surprised and engaging responses from those that he connects with. I’ll call it Goldberg Van View. There are five double-paged spreads of these and some of the portraits are enlarged in other parts of the book. By Vinny Martin. Self-published, 2017. As soon as I saw Vincent Martin’s Phonebooks I realized that this series of books were destined to be made by someone, it was just a matter of time. When looking at Ed Ruscha’s Royal Road Test, 1967, one wonders how Ruscha had the insight to predict that the advent of the personal computer of the 1990s would make the idea of throwing a Royal typewriter out of a car window at 90 mph a prophetic gesture. With Phonebooks, Martin has recognized that the phone has folded the camera into itself and continues to replace the autonomous camera as the camera of choice in our everyday lives. 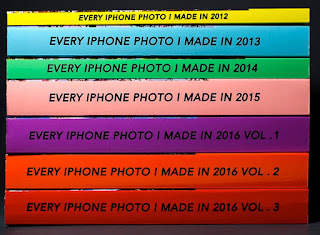 Martin has reproduced his entire archive of phone pictures in this ongoing series, Phonebooks, each volume documents a year of phone made pictures that begins in 2012. The early volume is fairly slim, but each ensuing year we see the Phonebooks grow fatter with more and more pictures, so that by 2017 it takes four big books to contain his yearly output (and there’s still more 2017 pictures to come). The subject of the photographs are just about anything and everything we respond to with our camera phones: snapshots of friends, visits to new places, street photos et al. With film, photographers would mindfully edit which pictures were worth taking, developing and printing. With the digital camera, one would still have to decide if a situation was worth taking it out. Gone are the days when we all wore cameras around our necks, but the smartphone rarely leaves our hands. Martin says he’s trying to “cut back” on his ratio of phone pictures to camera pictures. Good luck! The project hits us in the face with the embarrassing truth: not only are we (and by “we” I mean everyone, which includes those of us who still call ourselves photographers) are making more photographs than ever without a dedicated camera. Living in LA in the 70s I remember Robert Heinecken was known as the photographer who didn’t own a camera. Vincent Martin makes the point. Too bad there won’t be any cars with open windows in order to throw his phone away while taking the 200 mph Hyperloop pods from downtown Denver to the airport in 2021. Every iPhone Photo I Made 2012 - 2016 By Vinny Martin. Self-published, 2017. TAKING SIDES By Karl Baden. 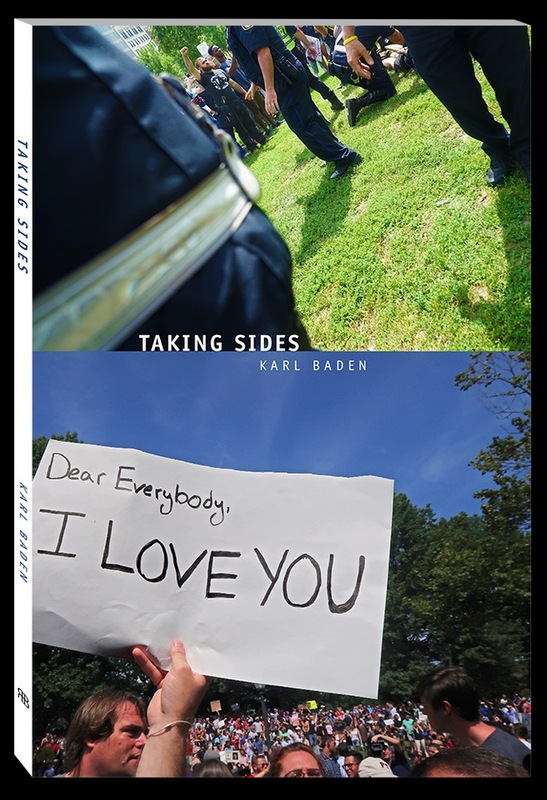 TAKING SIDES By Karl Baden. Retroactive Books, 2017.